StyleSpeak NAILATHON is India’s professional nail championship for nail art and design which offers a unique platform for nail technicians to showcase their skill and creativity. The contest has multiple categories and the winners of each category receives a plethora of prizes including the ‘Golden Hand’ trophy, cash rewards and exclusive coverage in StyleSpeak – the salon and spa journal and other publications. Besides the coverage, participants and winners alike benefit from the networking opportunities, extensive coverage in media and advice from their peers. NAILATHON also plays host to an exhibit area of different brands offering equipment, gadgets, design and care products for nails. The first edition in 2014 saw 63 contestants which increased to a whopping 89 contestants at NAILATHON 2015. NAILATHON proved to be a pioneer in the field bringing together talent and techniques from the industry, all under one roof. Held in high esteem, the event provided ample networking channels and allowed for learning about and from the best nail academies in the country. NAILATHON also offers a unique sponsorship opportunity for professional nail brands, to interact with their target audience directly. Sponsor benefits include logo branding on advertisements and invites and award medals. The sponsors are also provided with a ready booth to showcase their products at the event. 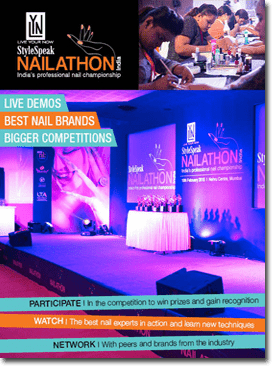 NAILATHON promises to be a recurring, annual event that will prove to be a stimulus for the nail industry in the country.